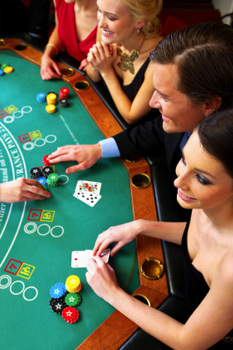 Texas Hold’em is the most popular poker game in the casinos and poker card rooms across North America and Europe. It is a community card game where each player may use any combination of the five community cards and the player’s own two hole cards to make a poker hand. In contrast, in poker variants like stud or draw, each player holds a separate individual hand. Because each player starts with only two cards and the remaining cards are shared, it is an excellent game for strategic analysis (including mathematical analysis). Hold’em’s simplicity and popularity motivated experts to write a wide variety of strategy books which provide recommendations for proper play. Most of these books recommend a strategy that involves playing relatively few hands but betting and raising often with the hands one plays. The two players to the left of the dealer put out blind bets. The player directly to the dealer’s left puts out the small blind while the player two to the dealer’s left puts out the big blind. Every player is dealt two cards, face down. These are called hole or pocket cards. The action, or the first move, falls on the player to the left of the big blind. She can either call the bet, raise it, or fold. Betting continues around the table, clockwise. After the betting is completed, three cards are dealt face up in the center of the table (the board). The first three cards in Texas Hold’em are “the flop.” These cards are “community cards” meaning everyone can (and will) use them in combination with their own hole cards to make the best hand. From the flop on, betting begins with the player to the dealerís left, who can check or bet. The fourth card, dealt face up onto the board, is the fourth street or the turn card. Another round of betting occurs. The final card, dealt face up, is the fifth street or the river. A final round of betting occurs. The remaining players show their cards and the person who can make the best five card hand by combining their pocket cards with the cards on the board wins. Note: In some rare cases in Texas Hold’em, the five cards making up the board will actually be the best hand, in which case everyone left in the hand divides up the pot.